This quick guide is going to show you how to setup your WordPress blog to match your FSB theme (This is only if you own a matching theme set from www.FreshWebMarket.com ). This example is going to show using the FLUID FSB theme for the store and the FLUID WP theme for the blog. The image below shows the FLUID FSB theme setup. FSB was installed as the main script in this example. So when you go to www.VTechDinos.com it will show the FSB store. 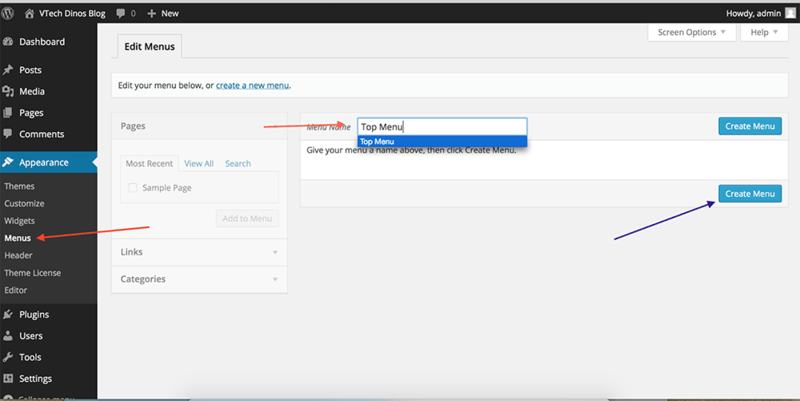 The image below shows the default WordPress theme when you install it. I have installed wordpress in a sub-folder called “blog”, so you would need to visit VTechDinos.com/blog to go to the WP section. 3.Then click on the ADD NEW button. 4. Then click to UPLOAD new theme button. 5. Then click the Browse button to find the FLUID WP zip file (if you are using a different WP theme, then you just need to find that zip that you downloaded from freshwebmarket.com). Once you found the file, click the Install button. 6. The next step is to activate the new WP theme, all you need to do is click the Activate link. 7. 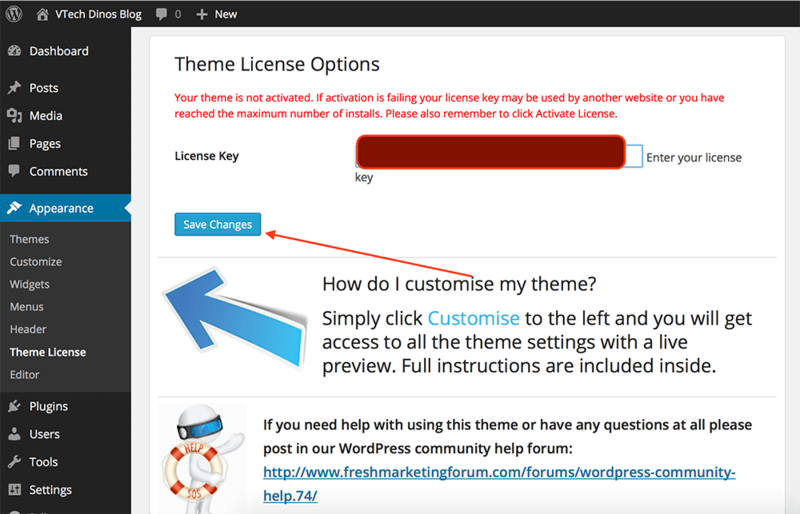 The final step to installing the theme is to add your license key. This is very important to make sure your theme stays updated. Click on the Appearance tab and then on Theme License. 8. Enter your license number and then click on Save, then click the Activate License button and you should be all set. 9. Your theme should be licensed and fully installed. Now you need to click on the Customize under the Appearance tab to get started. 10. Once you are on the Customize – Visual Editor. I recommend taking a few minutes and clicking each dropdown and reading the descriptions for each option. Depending on what WP theme you are using, you will have different options. In this guide I will go thru some of the options available to you in the visual editor. The first thing I will do is match the skin color that my FSB store is using to my WP blog. My FSB store is using the FLUID FSB theme Golden Skin. 11. You can see just by selecting the “golden skin”, it has already changed the font color for the blog. 12. Next, I’m going to upload the header image that is on the FSB store to my WordPress blog. You will need to click on the “Theme General Settings” tab. The Header settings tab, will let you select between uploading a logo or a full header image. The Home page setting tab will give you a few different options for your home page layout. I will be using the default WordPress layout for this blog. 13. Next I will upload a header image directly from the Visual Editor tabs, you will need to click on the HEADER tab, if you set your theme to display a LOGO only then you need to click on the LOGO tab to upload your image. 14. Next I will go over the widgets for the FLUID theme layout. You will need to click on the Widgets tab to get started. 15. The default widgets that come with WordPress are set under your “Header Custom Banner” area. You can easily drag them from the “Header Custom Banner” area to the “Sidebar” widget. The image below shows the widgets showing on the Top Header section. I will move them to the sidebar, image number 2 will show the widgets on the sidebar. All you do is drag them from one tab to the other. 16. The last step in this quick guide I will show you how to setup a quick menu to match your FSB store. Go back to the WP-admin, click on Appearance tab and then MENU. You will need to create a new menu. 18. Now using the “Links” tab, you can make custom links to match the FSB store. The next image below shows all the pages I added to the menu. They are the same as my FSB store. 19. Here is the finished product with the steps shown in this guide. I strongly recommend that you take the time and go thru each “Customize” option that your theme has. The different WP theme will have different functions but you will find them all under the “Customize” tab in your WP admin page. Q. I’m adding my license key but it’s telling me that its being used already but I have unlimited. A. Please submit a ticket at www.FreshHelpDesk.com and we will look at this for you. Q. The Upload method is not working for me using WP-Admin feature. A. I would recommend trying to manually upload the plugin folder to the /wp-content/plugins/ directory. You will need to upload the fresh store builder wp plugin folder into that directory, as shown in the image below.